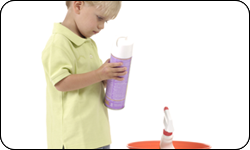 More than 2 million poisonings are reported each year to the 57 poison control centers across the country? More than 90 percent of these poisonings occur in the home? The majority of non-fatal poisonings occur in children younger than six years old? If you carry something that can be poisonous, such as a medicine or cosmetics in a purse or backpack, make sure to store it up high and out of sight and reach of the children. Don't take any medications in front of children. Safety latches on drawers or cabinets, and child-resistant caps on bottles, are helpful in keeping poisons out of the hands of children. But remember, they are not "child-proof" and do not substitute for your careful and constant supervision. A curious and determined child can find a way to get into something. Keep cleaning or painting products in their original containers. Do not put them in used soda bottles or other household containers. Remember that coin-sized button batteries – the types used in television remotes, car key fobs and other small classroom electronics – can be poisonous if ingested. Keep them out of the reach of children and be on the look-out for a child who is drooling, coughing or seems to be uncomfortable or in pain.